Beets (Beta vulgaris) may not be on everyone’s “favorite foods” list, but these ruby roots are hard to top when it comes to healthy eating. Beets have been a staple of inland diets for centuries and are now gaining attention as a sports performance-boosting food, and more. Future research will undoubtedly uncover more exciting benefits for this humble root. Kähkönen MP et al. J Agric Food Chem. 1999 Oct;47(10):3954-62. Kujala TS et al. J Agric Food Chem. 2000 Nov;48(11):5338-42. Wettasinghe M et al. J Agric Food Chem. 2002 Nov 6;50(23):6704-9. Petersen A et al. Food Addit Contam. 1999 Jul;16(7):291-9. Kujawska M et al. J Agric Food Chem. 2009 Mar 25;57(6):2570-5. Zielińska-Przyjemska M et al. Phytother Res. 2009 Jan;23(1):49-55. Webb AJ et al. Hypertension. 2008 Mar;51(3):784-90. Kenjale AA et al. J Appl Physiol (1985). 2011 Jun;110(6):1582-91. Velmurugan S et al. Am J Clin Nutr. 2016 Jan;103(1):25-38. Siervo M et al. J Nutr. 2013 Jun;143(6):818-26. Lara J et al. Eur J Nutr. 2016 Mar;55(2):451-459. Obrist R et al. Dtsch Med Wochenschr. 1986 Feb 21;111(8):283-7. Ninfali P et al. Phytother Res. 2017 Jun;31(6):871-884. Kapadia GJ et al. Cancer Lett. 1996 Feb 27;100(1-2):211-4. Kapadia GJ et al. Pharmacol Res. 2003 Feb;47(2):141-8. Kapadia CG et al. Anticancer Agents Med Chem. 2011 Mar;11(3):280-4. Kuriakose RK et al. Oxid Med Cell Longev. 2016;2016:8139861. Bailey SJ et al. J Appl Physiol (1985). 2009 Oct;107(4):1144-55. Lansley KE et al. Med Sci Sports Exerc. 2011 Jun;43(6):1125-31. Lansley KE et al. J Appl Physiol (1985). 2011 Mar;110(3):591-600. Ferreira LF et al. J Appl Physiol (1985). 2011 Mar;110(3):585-6. Domínguez R et al. Nutrients. 2017 Jan 6;9(1). Clifford T et al. Nutrients. 2015 Apr 14;7(4):2801-22. 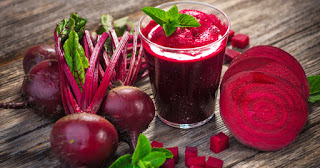 I absolutely love beets -- we roast them, I spiralize them and add to salads, and it's one of my favorite veggies to juice (start doing this when I was training for a marathon - great for muscle recovery!). They are just not used enough in my opinion!